There are many reasons Jackman, Maine is known as “The Switzerland of Maine,” and even more reasons you’ll want to vacation there at InnSeason Resorts Mountainview. From the rustic, natural terrain, to clear mountain lakes, and the picturesque Moose River Valley, this is a vacation destination for getting away from it all… and reconnecting with what really matters most. With scenic views in every direction, InnSeason Resorts Mountainview offers five log cabins and ten lodge suites for comfy, cabin-style vacationing. Located in a 40-acre woodland, you’ll love your Mountainview timeshare for hunting trips, mountain biking, hiking excursions, or a wintertime getaway for enjoying all your favorite seasonal sports. What Does Getting Back to Nature at InnSeason Resorts Mountainview Really Mean? And the precious opportunity to gaze “long” without development, signage, lights, or even people within your relaxing view. InnSeason Resorts Mountainview Lodge Suites: 1-bedroom timeshare suites, each with one private bathroom, a full kitchen, living area, and a private deck. 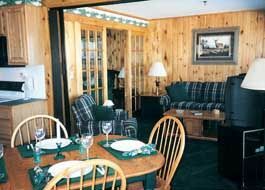 Some Lodge Suites include whirlpool tubs, and all offer televisions with VCR or DVD player, and the option to convert the living area to a private sleeping space. 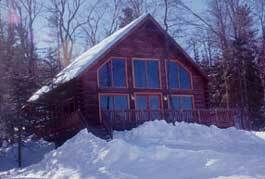 InnSeason Resorts Mountainview Log Cabins: Your choice of 2-bedroom or 3-bedroom cabins, all with two private bathrooms (one with whirlpool tub), a loft sitting area, well-equipped kitchen, living area with fireplace and cathedral ceiling, private deck, and a two-story wall of windows overlooking the great outdoors. 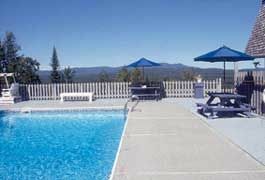 On property, enjoy both indoor and outdoor swimming pools, a sauna, pool table, a fitness center, a game room, a charming gift shop, and ample parking for travelers with oversized vehicles or boats or trailers in tow. Interesting fact for nature lovers: Families or companies privately own nearly all of the forested land in the Jackman, Maine area and most of it is maintained as “working forest land.” Some areas are used for timbering, while others are offered for recreational purposes in order to share the area’s natural resources while realizing a financial return from the land. Nearly 20,000 families own InnSeason Resorts timeshare, making it a regional resort favorite for New England timeshares. Vacation ownership is available either through the InnSeason Vacation Club or by purchasing timeshare ownership deeded directly to InnSeason Resorts Mountainview. Finding out more about this popular vacation provider is easy; just contact any of our specialists or search the available inventory. At BuyaTimeshare.com, we are here to help you make lasting vacation memories. Contact InnSeason Resorts - Mountainview Specialist Today! We wanted a place to relax for a week. We ended up having a blast! This was our third trip up to the resort, first in the winter months and had a great time skiing. After a day of skiing it was nice to go back to your own cabin and enjoy the fireplace and warm soup. We have had a great time each and every visit. Last time we went in the fall and the foliage was just breathtaking. Great place to relax or enjoy the outdoors. I highly recommend a trip.